Spectacular free WordPress theme aims to provide its users and visitors with a warm and pleasurable environment for personal musings and ramblings. 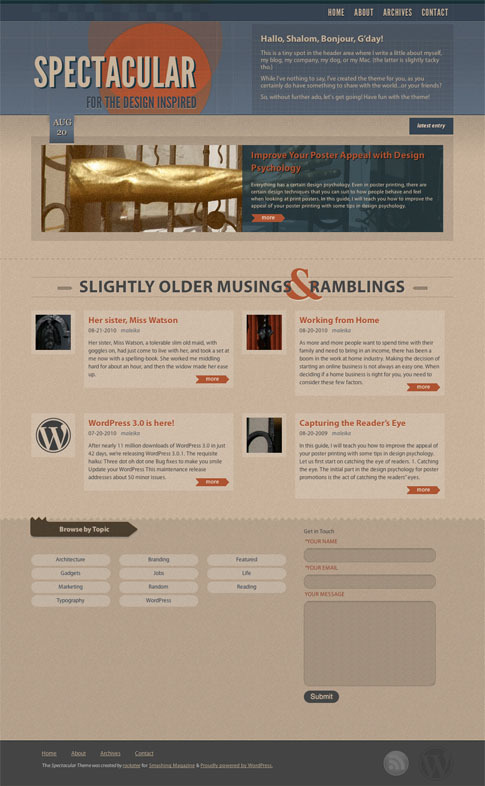 Spectacular theme comes in two different variations: HTML 4.01 and HTML5. Also, both German and English versions of Spectacular free theme are included with the download. The theme is cross-browser compatible and supports Opera, Safari, Chrome, Internet Explorer 7+, and Firefox. Support for Internet Explorer 6 is not available, though Spectacular works in Internet Explorer 6, too. Come back and check out the showcase as we find more sites from around the web using Spectacular.